Hi everyone, I’m Danielle of Brookhaven Studio and in celebration of launching my brand new website, I’m going to post a quilt tutorial today. I’ve made this Wish Upon A Star quilt a few times, most recently for some friends back in Raleigh that are having a baby girl. It works up pretty quickly and can be quilted in so many different ways for different looks. (9 different) 1/4 cuts of various pinks (you could do blues, grays, or even low volume whites for the background). These will be known as background fabrics. Cut binding as desired. I typically cut mine into 2.5” strips and piece them together and fold in half for binding. There are plenty of tutorials on Pinterest for making quilt binding. I find 2.5” strips give you room to work with as opposed to thinner bindings. Place a star fabric and a background fabric RST. Draw a line lightly in pencil, or using a water soluble fabric pen diagonally across the squares (dividing it into triangles). Sew 1/4” away from the line on either side. Cut down the pencil line and you’ll have (2) 5” half square triangles (HST). Repeat with all 5.5” squares. You should have (8) HST when you’re done. 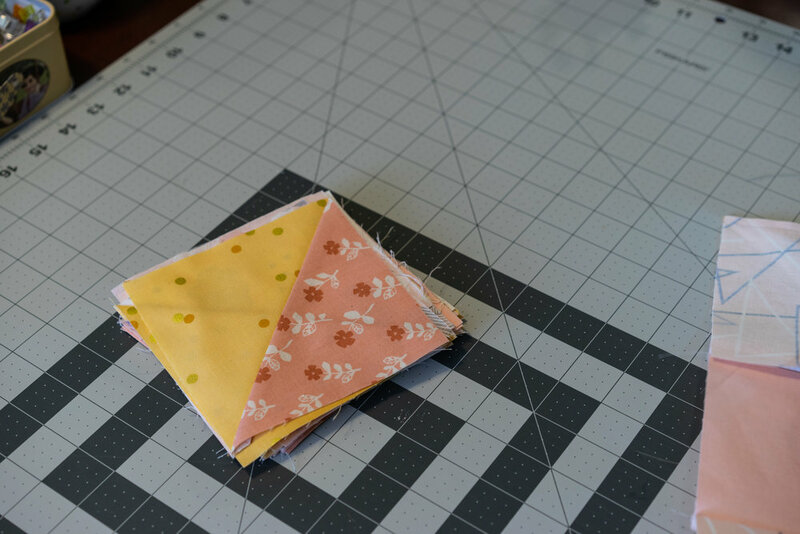 Make sure they are cut down to 5” squares so that everything will go together easily when piecing the quilt top. Follow the diagram below, sewing first in rows. Iron seams open when sewing rows. After all rows are sewn, sew the long strips together. Iron one row up, and the next row down repeatedly when sewing the rows together. Make sure that the ironed open seams line up when you are sewing the long strips together. After you’ve assembled the quilt top, quilt, back and bind as desired. The 1.5 yard backing is enough to just have a whole cloth back as opposed to piecing one. If you need help with quilting, backing or binding, there are plenty of great tutorials on Pinterest or feel free to contact me with any questions. Let me see your creations! Tag #wishuponastarquilt and #brookhavenstudio on Instagram if you make one!